I mentioned in my post about planning for upper level classes, that we typically start Mondays with a "Weekend Talk" or "Weekend Chat." I had heard about doing this for years in the CI circles, but never seemed to find time to do it. What is interesting is I have always been a #deptof1 so when I can not find time for something it is just me, myself and I putting tight requirements on pacing and curriculum. I am not sure why I felt the need to rush into the week full force and how I could not "find time" to spend a few minutes casually chatting in Spanish about what the students are thinking about. What do you want to talk about and think about on Monday? Your weekend! Do I want to make class interesting and relevant? YES! So I guess I should let us all spend some time talking about what we did over our weekend (or break). What is great about having routines like the weekend talk is is actually saves you time planning. Once you have a few options of how to talk about your weekend in your back pocket, there is a chunk of every Monday all planned out for you. This past year, I came back from maternity leave as a walking zombie teacher mom with a baby who got up many times a night. As we are approaching baby #2's 1st birthday he still gets up at least once per night to eat. This means I can use all the no prep, ready to go activities I can get. This year I plan to start Mondays in Spanish 2 and above with some variation of a weekend talk. I hope to add in Spanish 1 second semester as well, as it is a great way to casually and naturally bring in past tense. For easy planning, I usually decide on one variation that all classes will do on a day, but you can always let them pick from a couple options as the year goes on and they know their choices. Instead of boring them to tears having everyone go around and say one sentence about their weekend in past tense every Monday, here are my favorite variations on a weekend talk. 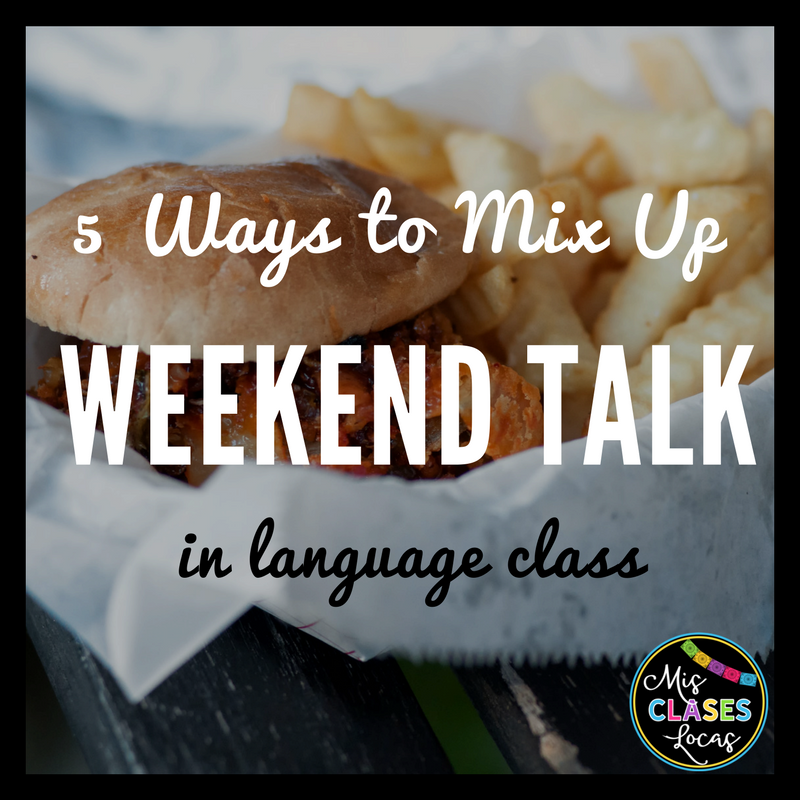 This is the easiest way to ease into a weekend chat, as well as provide the input necessary for students to be able to regurgitate what they did as well. Starring in level one you can spend a few minutes using a couple pictures from your weekend to describe what you did. To keep this fresh, I love the idea Jon Cowart shared in the iFLT/ NTPRS / CI Teaching FB Group, to tell students crazy stories about your weekend in Spanish and let let decide what is true. If you want to mix it up even more, you could tell about the real or made up adventures of your pet, child, or a famous celebrity. For lower levels, you could also type up and project what you did, reading as you go to provide visual input as well. Students are given a prompt on the board to interview their partner about their weekend. They can then share what their friend did over the weekend, instead of talking about themselves. Andrea Brown shares a helpful handout to give students in this post. This is a good way to get in other forms instead of just I.
I used to use this icebreaker as a camp counselor all the time. I did not think about using it in the language class, until it was in a unit plan from Martina Bex. Now I always keep these 1/4 sheet 2 Truths & a Lie forms ready to go for a no prep weekend talk activity. Students grab a sheet on their way in and write two things they did and one they did not without telling anyone what they are writing. They place them in a basket once done and the teacher reads them one by one. By having the teacher read them out loud you can fix any errors (without ever letting them know) and make sure what is heard is correct. In my class I first have students guess who wrote it, and then guess which is the lie. To give students the chance to interview many others, you could set up two lines or an inside/outside circle for speed dating. This is less intimidating then talking in front of the whole class, and allows for students to practice asking and answering a few times, rotating every couple of minutes with music. Andrea Brown shares a helpful handout and instructions in this post. If you have a class that just needs to move on Monday morning, a find someone who people hunt is for you. I have found that these are especially great for the first day back from breaks, when students have a ton of energy. The first day of Spanish 2 and 3 this year, we will be doing a Find Someone Who about mi verano. For the first day back from winter break, I like to use this activity from Martina Bex. 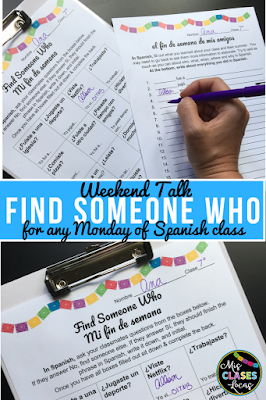 I wanted a no prep option that could be used on any Monday of the year to talk about the weekend in general, so I made a Find Someone Who - Weekend Talk. I am going to print off enough of these for all classes and have them ready to go as my emergency Monday plans. There is a version with the verb forms provided that I will use with lower levels, and one without for upper levels. With the possible extensions, including writing about classmates, it could easily fill an entire class period if needed. Even though I try to leave Friday with my plans ready to go for the next week, this is going to be my go to back up for a Monday. It would also be great if a chunk of kids will go gone so you do not want to move ahead on your unit or novel, but want something engaging and worthwhile for the rest to do. What is your favorite way to chat about the weekend? Please share! !